Today in Canberra Small Business Minister Stuart Nash signed the formal trans-Tasman e-Invoicing Arrangement with Australian Assistant Treasurer Stuart Robert. As well as signing the Arrangement they also discussed the longer-term advantages for businesses using the Australian Business Number (ABN) and the New Zealand Business Number (NZBN). Nash says e-Invoicing will help businesses in both countries save time and money by allowing the direct exchange of invoices between suppliers’ and buyers’ financial systems. “This Government is committed to growing the economy and working with businesses to encourage productivity. 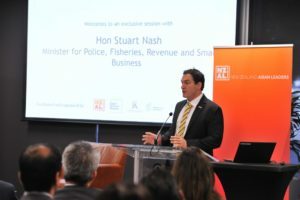 This agreement is another step we have taken to support small businesses in New Zealand over the last year,” says Nash. This cleared the way for NZ to pass the Comprehensive and Progressive Agreement for Trans‑Pacific Partnership (CPTPP) legislation. This in turn allowed NZ to ratify the agreement. New Zealand today ratified the CPTPP taking to four the number of countries that have formally ratified the Asia-Pacific trade deal. Parker is in Ottawa during a six day trade trip to the United States and Canada for talks focused on the future of the World Trade Organisation (WTO). “Economic modelling shows exports, the New Zealand standard of living, and wages, will increase as a consequence, Parker said. “Important changes were made in CPTPP, compared with the original TPP, to deliver on this Government’s bottom lines including, protecting drug agency Pharmac, the Treaty of Waitangi, and the Government’s right to regulate in the public interest,” Parker said.